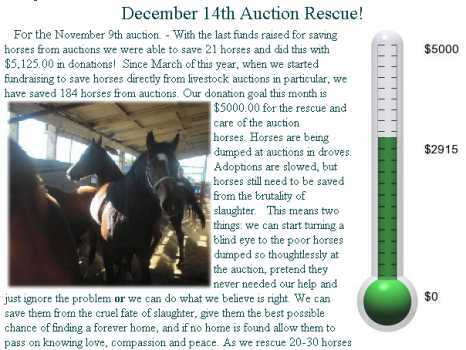 Wow, what an amazing display of love for horses, the auction fund now has $2915 in it. We are getting very excited about saving lives in a few more days. We would like to raise the entire $5,000. The more funds we raise, the more lives will be saved. Today was a “normal” day almost. Office work was done, adoption applications were worked on. 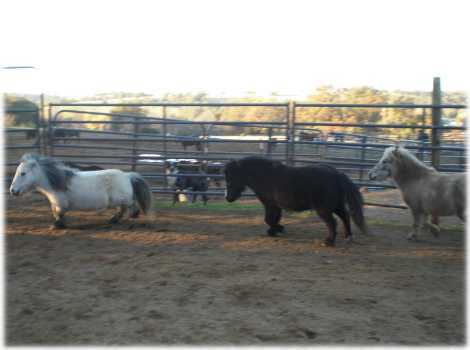 Horses were showed to potential adopters. All in all, it may have been the most normal day we have ever had. Claire got out of the office long enough to spend time with the new mini’s. They are so incredibly cute! We were able to get their too tight of halters off that they came with. They seem quite happy without them. Tawnee decided that the mini’s should play together. 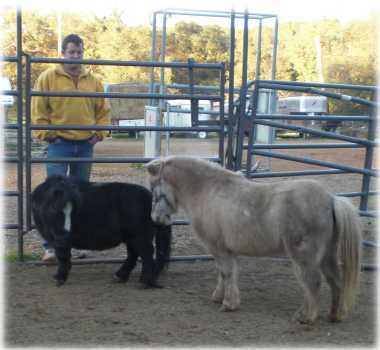 Tawnee got Dottie and Macho Man, who are dwarfed miniature horses, out and put them in the nice sandy round pen with the new mini’s. Dottie stands at 30 inches and Macho Man is 28 inches. 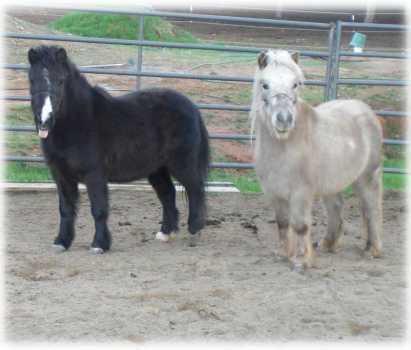 Patty and Buck were quite amazed to see even smaller horses than themselves. Patty and Buck are about 33-35 inches tall. 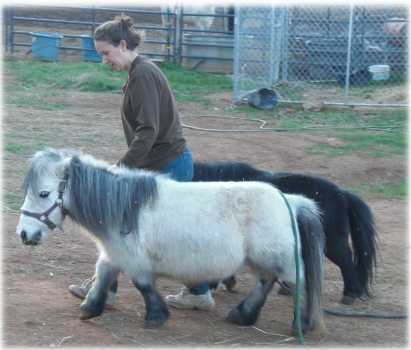 No doubt they have never seen a horse smaller than themselves. Buck’s tongue fell right out of his mouth in amazement. It definitely made them feel big and important. Patty and Macho Man enjoyed making peace right away. And then the race was on! 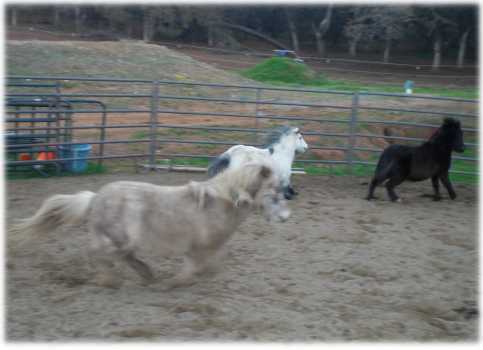 Dottie and the others all enjoyed running around, playing and jumping for joy. Any idea’s why we call Dottie our little wiener horse? All body, no legs. Macho Man and Buck looked so cute prancing around together. We’ve decided that we should change Patty’s name to Sandy Patty. Put her in a sandy round pen and she will blend right in. We are very interested in watching this film. 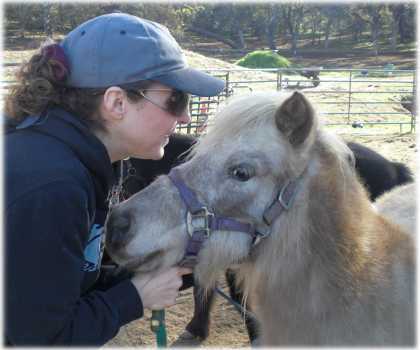 While we are far away from New York, there are horse drawn carriage operations all over the nation, including in our own little town of Oroville. Tawnee was driving home the other night through downtown in the freezing cold, and there was a poor horse drenched in sweat pulling a large carriage along the streets. There were dozens of folks lined up to go for a carriage ride, waiting patiently to make him work even harder. The fact is, horses + cars = extremely dangerous. 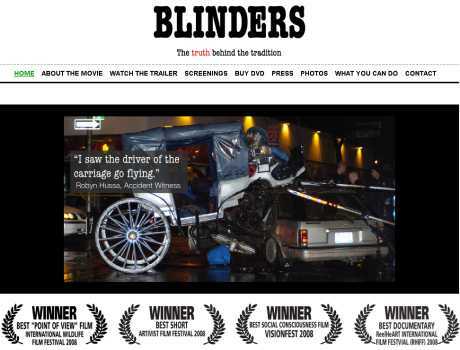 We are glad to see there is a very enlightening film that will hopefully bring relief to the poor horses that work tirelessly pounding their joints apart on hard city streets day in and day out, dodging speeding cars literally for their lives. If you watch the preview you can see where a lot of horses live: in the upper stories of abandoned apartment complex buildings. 4 days until the auction, we are hoping and praying that the funds will come in to enable us to rescue the needy horses at the upcoming auction. Thank you so much for your support! 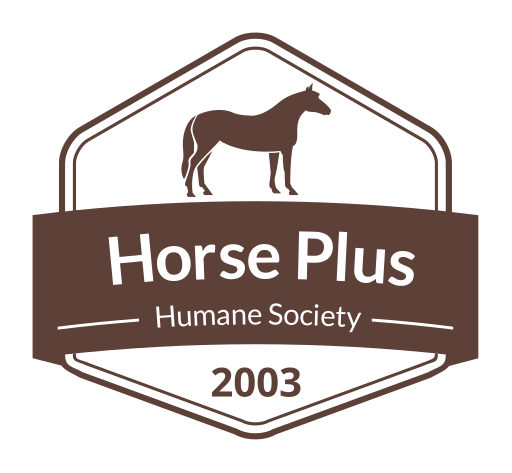 As ‘horse people’, and especially since you are in rescue, I urge you to look beyond the propaganda piece “Blinders’ if you are truly interested in understanding us and out industry.There is not an endeavor involving horses on earth – private, public, not for profit, for profit, et al -that cannot be scrutinized selectively, and by stringing images together and stating both half-truths and lies – made to look unsustainable and even horrifying.This is what Blinders is – a slanted, vicious, dishonest, and incomplete hatchet job on our beloved business, by a man who started out looking to make a name for himself. (backstory on this available)I don’t expect you to take my word for it. But, I would urge you to view Blinders with a very critical eye, and avail yourselves of our side of the story.We are ‘horse people’, too. 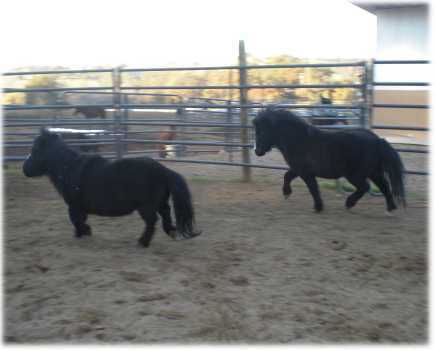 Our horses are beloved; we work with several horse rescues here on the East Coast; we give a job and a content, happy existence to horses in this world where thousands of horses go to slaughter everyday.This is my blog http://thewhiffletreenyc.blogspot.com/I’d be more than happy to answer any questions you may have. I would like to stat e a few misconceptions that I just read.There are NYC Carriage stable owners who actually salvage many slaughter bound horses,exactly the opposite of what we are often accused of.AC4H,Another Chance 4 Horses in Bernville Pa,is a wonderful dedicated rescue that I am personally am connected with and donate my own retired carriage horses to,to rehome when we feel that its retirement time.We also have been on the end of adopting very serviceable animals that needed rehab and lots of TLC.WE have a lovely Standardbred that was lovinging fundraised to my care that lives in NYC and became a Theraputic Riding Horse in my own Carriage Horse stable,and for light excercise is a carriage horse occasionally to stay fit .There is clearly a huge confusion defining USE AND ABUSE,for The NYC Carriage Horse Trade,NOBODY has been convicted of animal cruelty while horses were in their custody in the city or at work.The amount of inspections conducted both at the carriage stands at the stables are far more than most hospitals and restaurants recieve in this city.Our stables have 24 hr stable staff,3 vets on house call 24/7,a group of farriers who come to us,equine dental techs,and even a chiropractor! Efforts should be placed on the abuse that goes on with horses far less in the public eye.We have 8 million people’s eyes lookiung at us everyday!